TS EAMCET 2019 Answer Keys on eamcet.tsche.ac.in : TS EAMCET 2019 answer keys are to be released on its website. Jawaharlal Nehru Technological University, JNTU Hyderabad is expected to release the TS EAMCET 2019 Answer Keys on May ... 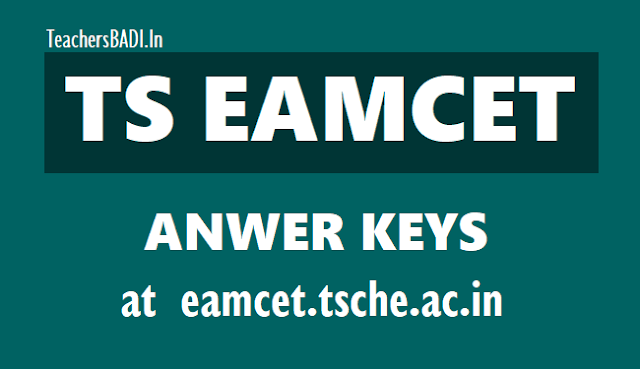 The answer keys would be released on the official website eamcet.tsche.ac.in. Though there is no confirmation of the same on the official website, the answer keys would be released soon after the end of the final slot of examinations. JNTU is most likely to release the Answer Keys for the Agriculture entrance examination first. The answer keys for engineering entrance examinations are expected to be released tomorrow morning on the official website. Steps to download the answer keys are provided below. Candidates to please note that in order to access the OMR sheets, they would have to login to their registered accounts and check the same. Also, candidates would be able to raise objections. The exact details about process for raising objections would be available once released. 4) Last date for submitting objections on preliminary key is..
Telangana State Council of Higher Education, TSCHE conducts the entrance examination EAMCET for admissions to engineering and agriculture courses. The admissions to medical courses in the state would be done on the basis of NEET 2019 examination. The exam was conducted on May ..for agriculture and related courses. The engineering entrance was conducted on May ..